Happy hump day! The incidents don't stop, we will drive to Berlin tomorrow but as of today we are both sick, to the point that hubby couldn't go to work and we spent all day sleeping. I am hoping that tomorrow it will be better. I can't believe how many times I got sick this winter. Now that I am working at the university and being exposed to so many people at once, I am having a major virus update in my system. I hope that I will become the super human who doesn't get ill at all once it is finished (wishful thinking!). Skincare for eyes? Sign me in! I have all kinds of problem with dryness under and around my eyes to the point that most of the concealers, even the super duper hydrating ones get flaky there, making me appear 20 years older. That is really not the intention of a concealer is it? My other problem is that, although I read everywhere that I should be sleeping on my back and avoid hard pillows, I really can't follow these recommendations. I was never a back sleeper and I need my orthopedic memory pillows with neck curvature and all kinds of jazz. In my mid thirties, now I have not only fine lines around my eyes but also a major line under one of my eyes, which happens to be, coincidentally, on the side I usually sleep *sigh*. I see two options, embrace my lines, which, I do, alright... And the second... Use fancy skin care. Let's get into details here. La Mer just released an addition to their Lifting products, La Mer The Lifting Eye Serum. I put it into test for some weeks now and here and my thoughts. 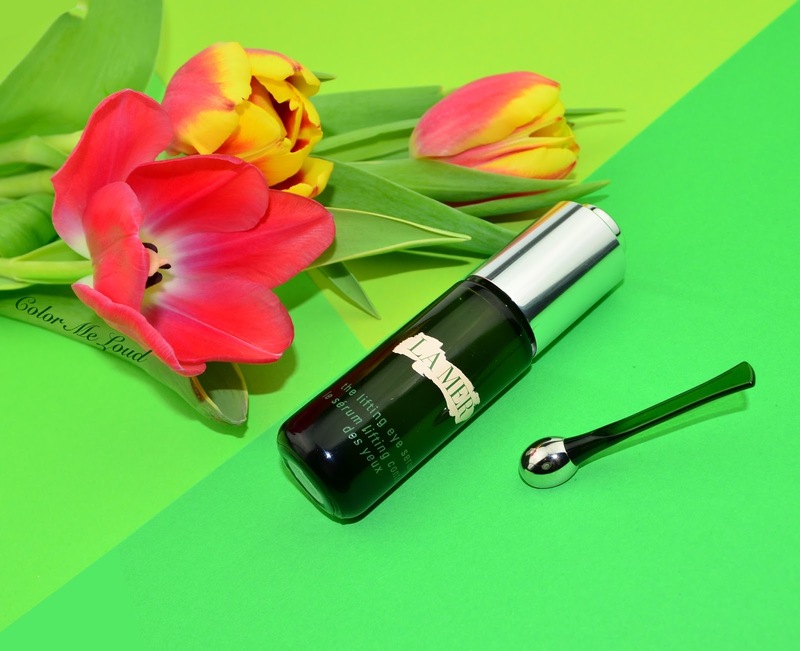 I have been using La Mer Illuminating Eye Gel (reviewed here) since the day it was released and I am happily on my second bottle. That one is miracle with a pump, the only eye gel which really hydrates my super dry under eye area. In the mornings I sometimes reach for Clinique Custom Repair Eye Treatment (reviewed here) which is lighter weight therefore doesn't make my concealer crease. That is the thing with the eye hydrating products, if you manage to hydrate so well, you need other concealers which are for normal to combination skin. When I started using La Mer The Lifting Eye Serum, the first question which I would love to answer was, is it better than Illuminating Eye Gel? The answer to this is that, they are not substitutes and that they are very different in usage and the area of effectiveness. 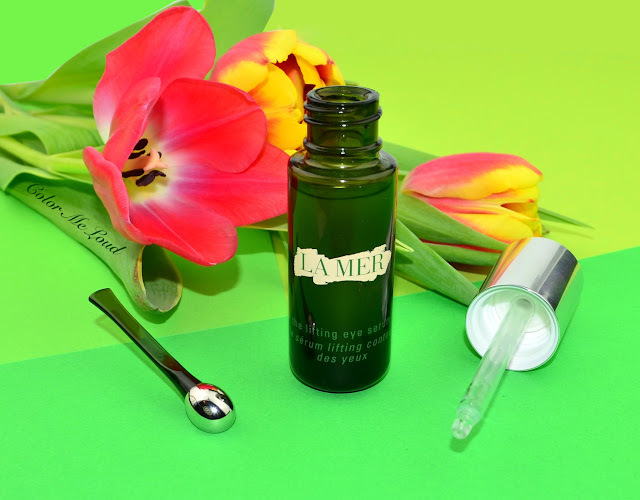 La Mer The Lifting Eye Serum comes in a dark green glass bottle, which is great to protect the ingredients from sunlight. It comes with push dropper, very much like La Mer Renewal Oil (reviewed here). I think this one doesn't have two phases like the oil does but I shake it gently to make sure miracle broth is activated. The bottle has 30 ml of product, which will probably last me around a year if I use it day and night. You really need one drop for each eye area, not more. I am using it for almost a month now and you can see how much I was able to use up in the photo below. The Lifting Eye Serum also comes with an additional applicator with a metallic tip. This is supposed to be used to massage the areas of application (eyes and under the brow bone). After cleaning, it is recommended to cool under the eyes and under the brow bone with the round side of the metal applicator. Then I take one or two drops on my ring finger to tap it gently under the eyes. I take the access under the brow bone and on the side of the eyes too. After this La Mer suggests that one can use the flat side of the metal applicator to massage under the brow bone. You can see some illustrations here. The most interesting part of the magic is, how it feels. After I tap a drop or two, it is absorbed very fast but leaves behind a layer of slight stickiness. I was not sure at that point if I was doing the right thing but then the magic starts happening. You can literally see that it lifts the areas of application in the following minute or two. It happens fast but if you are applying this under your concealer, you have to plan this time. I usually apply it right after the shower and until I am dressed, there is nothing left of stickiness. Instead, it leaves the softest skin behind possible. I love applying a little under the brow bone to lift this area as well. 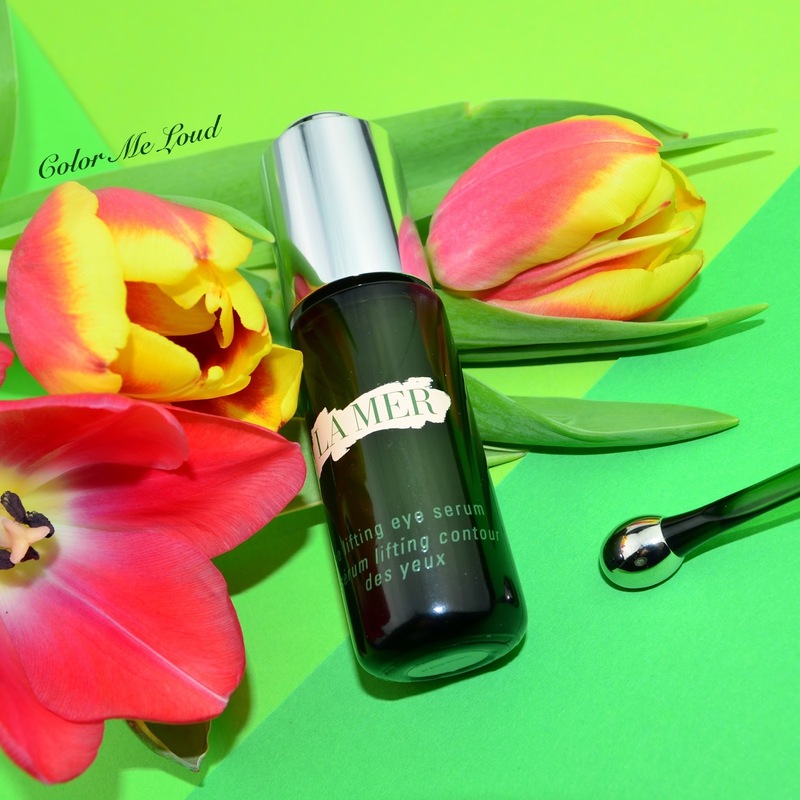 La Mer The Lifting Eye Serum is an anti-aging eye serum to lift so if you are searching just for a hydration solution, I would recommend you check out La Mer Illuminating Eye Gel. If you would like lifting and anti-aging, then La Mer The Lifting Eye Serum is the right one. Since I need both, I am applying the serum first and finishing with a touch of Illuminating Eye Gel. Since serum prepares the area, I need less eye gel after that. I think The Lifting Eye Serum is great for day and night alike but I am especially loving it in the morning since it gives my face a fresh lift, yay, who would like that? EDIT: Some of you asked about the ingredients list so I visited the counter in KaDeWe during my Berlin visit this weekend and took a photo. 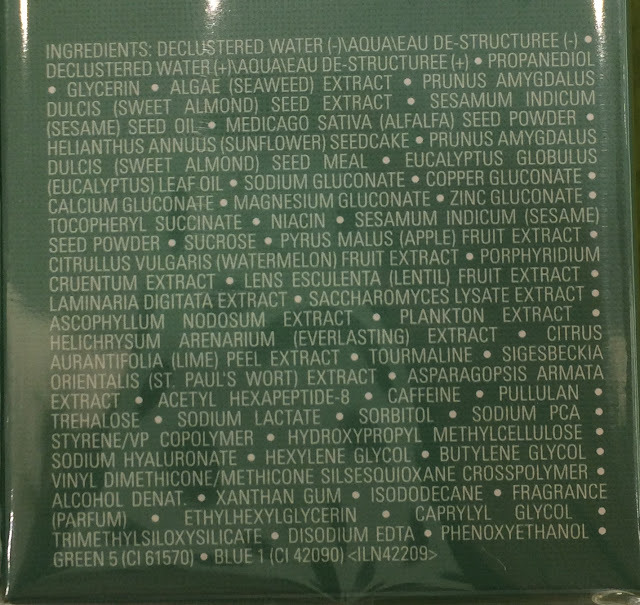 La Mer counters are always equipped with copies of ingredients of their products which they give upon request but since this product is new, they didn't have any. A lovely assistant tried to offer the best non-reflecting condition for the photo, thank you for that. Final thoughts: La Mer The Lifting Eye Serum gives me the most effective lift I have tried up to date. It needs around 4-5 minutes to be absorbed fully, then you can go on with your morning routine and make-up as usual, of course with the exception that, you will be dealing with a more beautiful canvas than before. Big love, make sure to checkout out at a counter. Oh and don't forget to apply the rest under your brow bone. Availability/Price: La Mer The Lifting Eye Serum is now available. 15ml lasts you a very long time and sets you back around 210€. Do you use gels, creams or serums around the eye? Which texture is your favorite? I hope the baby doesn't catch what you and hubby have! I am having second thoughts too, maybe we shouldn't come very close after all. I will ask her mother and make sure she knows the situation. I got a PR sample without ingredients list but I will visit a counter to make a photo of the list for you. I haven't had any bad experience/reaction with La Mer until now, I think they use the best ingredients possible. Can you give an example of what exactly you mean and in which product? Oh Nati, winter is really not good. I was living a very isolated life and the people who are sick never come to office here (which is a great thing) so for years I haven't caught a single virus. This year this is my 3rd or 4th, I can't even count! No offense here, I will review more skin care, also in mid-range budget, you might find them interesting as well. Good resolutions to stick with is always a good idea as long as you can find products which work for you. For my eye area, I really have a problem to find something which works. I would splurge one hundred (two? I dunno!) without even noticing for eye-care, but I am very satisfied right now with my current cream. I am open for testing though! I love La Mer. I might need it only in a few years, since I still haven't dry skin LOL! For conventional skincare I now and then turn to Sisley; they have very rich formulas, too. You might check this out also! Well an eye lid lift sounds good. But whenever I look at the ingredient lists of such products, it's always butylene glycol or something. My question is does the lifting last and build over time? I also got a bad cold/flu this year, I was feeling really bad for 2 weeks! I don't think I've ever been sick for so long before. Anyways, this eye serum looks lovely, I wish I could try it. I really can't fit La Mer into my budget right now, but I'm hoping I will be able to soon! That little metal applicator looks like it would feel so refreshing under my eyes. Sisley has great products. I haven't tried their eye care yet, have to do. Would you recommend a particular one? Thank you, Sara! Actually that is a pretty good ingredient list. Always like to know what the actives are too. Inspired by your review, I have just been investigating the Clinique and Clarins offerings in the eye lift department. According to Paula's Choice the Clinique eye lift effect can also be obtained from their regular serum. And the Clarins has grapefruit peel which is photo-sensitizing. I use oils which work well for hydration, but not so much for lifting. Yay, I'm so happy to hear it actually works! Get well soon, this time of year is horrible with all the colds and flu... I woke up feeling a bit under the weather too. Sniffing, sneezing, sore throat, blegh. Oh dear, hope you managed to enjoy your short trip even despite being sick and all. This sounds really exciting... my poor droopy eyes need all the lifting help they can get! And i'm a side-sleeper as well. Can't sleep on my back to save my soul, but the strange thing is during my pregnancy, when I was fat as a cow and couldn't sleep on my back anymore, I REALLY wanted to!!! Bizarre I tell you! thank you very much for making a picture of the ingredients list! web, and all of this plant oils are proven irritants that can even be pro-aging! so thanks again for your help! Oh, ok, I am glad it was helpful. Paula Choice Database doesn't have the Leaf oil listed. Was your serum with Leaf Oil?